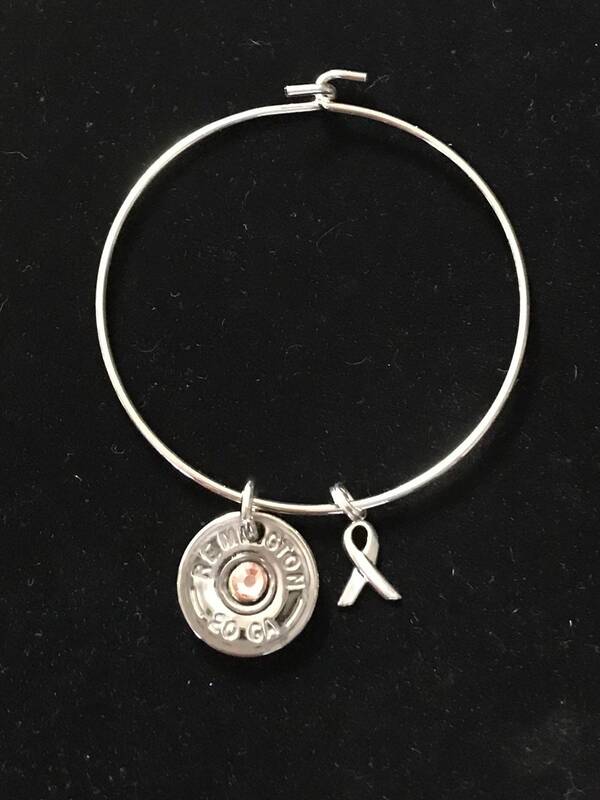 Recycled shotgun shell cancer charm bracelet. ***You must specify the type of cancer in the “notes to seller section” if you want the colored stone that is associated with that cancer included on the bullet casing. *** Example: breast cancer is a pink stone, liver cancer is a green stone, brain cancer is a grey stone. You do not have to know the stone that coordinates with the cancer. Let me know the cancer and I will reference a chart for the specific color crystal. The "All American Girl" bullet bracelet (God, Guns & Boots) - 28 gauge shotgun shell charm, boot charm, and cross charm.